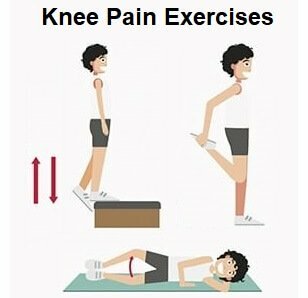 Knee strengthening exercises will help nearly all cases of knee pain and can even prevent knee problems from developing and recurring. Here we will look at intermediate level strengthening exercises for the knee and leg muscles. 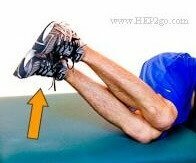 I have grouped these knee strengthening exercises by muscle group: quads, hamstrings, buttocks, kneecap, calves and balance. Pick the ones you find best for you. If you haven’t already tried the beginners strengthening exercises, I suggest you start there. Once they are feeling easy, come back to these ones. Then, when you have mastered these ones, you can move on to the advanced knee strengthening exercises. These are the muscles at the front of the thigh that straighten the knee. Weak quads leads to increased pressure through the knee and knee cap. Knee strengthening exercises for the quads is one of the most effective ways to reduce knee pain. Action: Slowly slide down the wall a few inches bending your knees. Hold for 3-5 seconds and return to starting position. These are the muscles on the back of the thigh and the buttock muscles and they often work together. Most people with knee pain have weak glutes, but they are often ignored. Having weak glutes and hamstrings increases the forces going through the knee. Along with the quads, knee strengthening exercises for the glutes and hamstrings are one of the best ways to reduce pain. Muscle weakness can lead to patella maltracking, where the kneecap doesn’t move properly, which is a common cause of knee pain. Targeted knee strengthening exercises for the muscles that control how the kneecap moves can make a big difference. Starting Position: Sit in a chair, feet hip width apart with a soft football in between your knees. The calf muscles are at the back of the leg, below the knee. They help support the knee and co-ordinate knee and ankle movement. Starting position: Stand on one leg holding onto something solid e.g. table or wall for balance. The knee plays a vital role in ensuring good balance and proprioception. This is often affected when there is knee pain and doesn’t always improve after an injury, even once the pain goes away. This leads to an increased risk of further injury in the future. As a quick test to see whether you would benefit from balance exercises try standing on one leg with your eyes closed. If you can’t do it for one minute, you’ve got some work to do! Knee strengthening exercises should be challenging, but not painful. The more you do them, the stronger your muscles become and the easier the exercises are. It is important to work at the right level to get the best results without damaging your knee. If exercises are too easy, they won’t make much difference, if you work muscles too hard, they may cause pain. See our Top tips on getting knee strengthening exercises right section for more info. You will probably need to do knee strengthening exercises at least four times a week for a month before you notice much of an improvement in your knee pain so stick with it! If these exercises feel too difficult at the moment, try some beginners strengthening exercises for a few weeks and once your knee is a bit stronger, revisit this section to help you. You may want to mix and match basic and intermediate knee strengthening exercises. Be creative and keep exercising if you want to beat your knee pain! Once you have mastered these strengthening exercises, CONGRATULATIONS! You are ready to move on to advanced knee strengthening exercises.